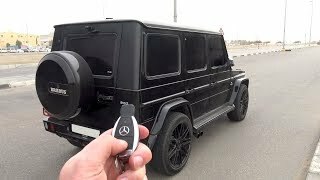 The recently unveiled all-wheel-drive model Mercedes G500 gets the attention of Brabus engineers and this off-road model from the house of Mercedes gets remarkable touch of engineering to better your experience. 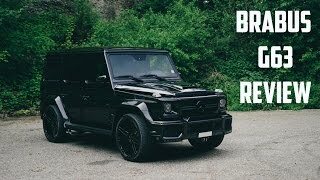 We are here talking about the monstrous Brabus Mercedes G 500 2015 which now has more power and better comfort for your off-road rides. Let us have a look at the review of Brabus Mercedes G500 2015 to know better. The G Class model gets world-class refinement and thus gets molded to serve you beyond imagination. Looking at the changes it feels like, that while creating Brabus Mercedes G500 2015 the only thing engineers could have in mind was perfection. Apart from the Brabus performance kit, model also received high-end Brabus paint finish and targeted body modifications. Not only is this, but the interior of Brabus Mercedes G500 2015 comes wrapped in Alcantara and Mastik Leather for the superior touch. The performance kit that we talked about is the all new specially designed BRABUS B40-500 PowerXtra performance kit. The kit includes a plug and play control module adapted to the electronic management system. Let us have a look at the end result that comes after creating the Brabus Mercedes G500 2015. Beneath the hood of Brabus Mercedes G500 2015 sits the same twin-turbo V8 which previously used to develop total output of 428 hp and peak torque of 610 nm, prior to all the modifications. 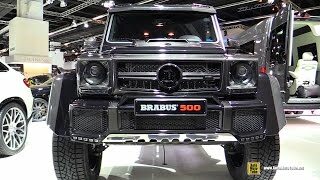 After all the modifications the same engine now gets the boost of 78 hp and 100 nm and thus now creates throbbing 500 hp and total output and peak torque of 710 nm mated to seven-speed automatic transmission.The new power figures take the performance of Brabus Mercedes G500 2015 to new heights and thus the top speed of Brabus Mercedes G500 now can touch 130 mph, which is electronically limited while the 0-62 mph sprint can be knocked in 6.9 seconds.